Make Waves encourages readers to step up and be the one to initiate change in their work and lives. Author Patti Johnson walks readers through the tools and techniques that they can use to create change in their own situations. Johnson elaborates on these tools even further to give readers a sense of how to encourage and instill these "wave-making" behaviors in others within their organization. Using several diverse case studies as illustrative examples, Make Waves highlights the important steps that individuals at any level can take toward positive change. By reinforcing readers' desires to contribute and make a difference, Johnson connects on an individual level and bridges the gap between that desire and the actions necessary to realize bigger changes. Change can be big or small. It is the act of stepping up that Johnson embraces, as well as the ripple effect on those around. Interviews with famous Wave Makers, as well as everyday people, illustrate why it is important to be the one to start change. Wave Makers profiled include: Clint Hurdle: Manager of the Pittsburgh Pirates; believes in positive attitude and culture and changes the MLB clubhouse; this year leading the Pirates to their first winning season since 1992. Charley Johnson: Started Pay It Forward foundation. Joe Nussbaum: Started Big Event at Texas A&M when in college in the '80s and has continued to grow; largest one-day college community service day in the country and has been adopted by over seventy universities. Emma Scheffler: High school soccer player who started Insulin Angels, a nonprofit for children diagnosed with diabetes, after her own diagnosis; feared her dream of college soccer was over, so engaged other students and local hospitals after thinking about how to make her diagnosis a positive. Allen Stephenson: Started Southern Tide at twenty-two-years old when in med school and followed a passion to create a clothing line; built momentum by creating interest and participation on southern college campuses; they are now growing rapidly and it started with a great polo shirt. Patti Johnson is a career and workplace expert and the CEO of PeopleResults, a change and human resources consulting firm she founded in 2004. She and her team advise clients such as PepsiCo, Microsoft, 7-Eleven, Accenture, Frito-Lay and many others on creating positive change in their leaders and organizations. Previously, Johnson was a Senior Executive at Accenture. She has been featured as an expert in "The Wall Street Journal, The New York Times, MONEY Magazine, U.S. News" and "World Report," NBC.com, HR Executive magazine, Working Mother, and SHRM. She was selected as an ongoing expert for "SUCCESS" Magazine and "Fox Good Day." She is also an instructor for SMU Executive Education and speaker on "Leading Change." 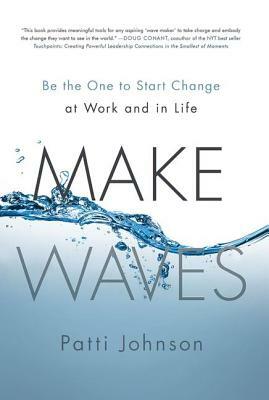 Johnson's first book, "Make Waves: Be the One to Start Change at Work and in Life," will hit shelves in May of 2014.